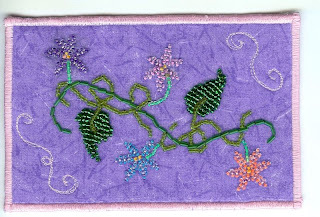 I thought I would try my hand at beaded embroidery, and what better size to practice on then a 4 x 6 fabric post card. I sewed each of those beads on by hand. It was time consuming, but very relaxing for me. I have seen tutorials online that show how to sew beads on by machine, which would probably make the process slighty faster, but I really enjoy the hand work. I also played around with my embroidery machine and made this little cutie. She is the May girl from my Girls of the Month Series. 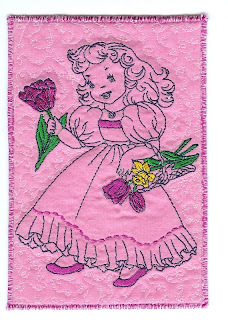 She will be sent to Mary A. for the fabricards May Mingle swap.